I’m Stephen Walker, and I’d like to welcome you to my blog, the purpose of which is to provide lively and informative tidbits about some of my favorite things about St. Louis, primarily in the areas of architecture, design and history. I’m a graphic designer by trade, and in my off time I enjoy drawing house portraits, under the business name of Walker Studio. 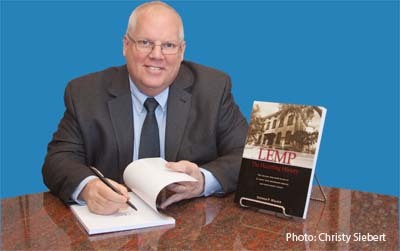 In 1989, I authored “Lemp: The Haunting History,” which chronicles the tragic legacy of the Lemp family of St. Louis, best known today for their former residence, the Lemp Mansion. Now a restaurant, the mansion is widely known as one of the most haunted places in America. As an avid fan of astronomy, I designed the Delmar Loop Planet Walk, a walkable scale model of our solar system. Dedicated in 2009, it is a permanent installation in the Delmar Loop. The 2,800-foot walk is located along the sidewalk on the north side of Delmar, beginning at the Moonrise Hotel. Like the actual solar system, it is outside, and ready to be discovered and enjoyed by anyone, at any time.